I always find it hard to keep my phone well locked in my pocket even though the BlackBerry lock button are pretty handy in such instances but may not always be the best method as these are physical buttons that are still vulnerable to such incidents. There are other password solutions like entering a password or the pattern lock. Team Bulbera came up with this new unique app to let us slide upwards rather than to remember a password or the usual slide to the side to unlock our phone, which could also help increase security a little more. Starts automatically when your BlackBerry® is powered on and runs silently in the background. However, you can easily turn it off at any time. Configurable background. Use one of the backgrounds coming with the application or select a picture from your device memory / SD card. 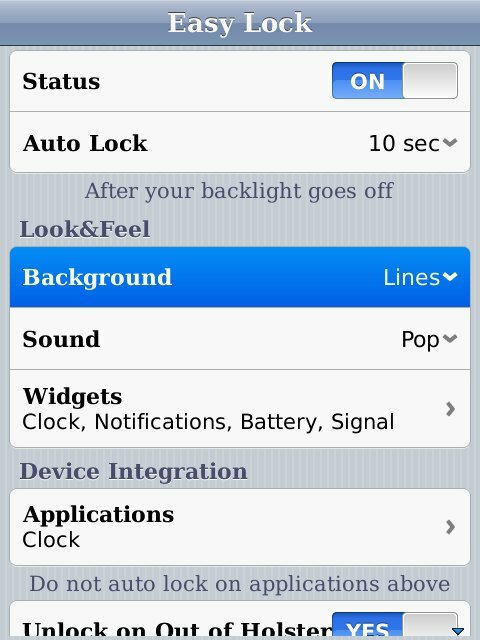 Customizable widgets: clock, notifications (new emails, SMS, BBM etc. ), battery level and signal strength. 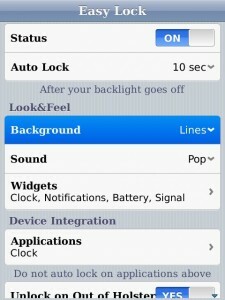 Option to disable auto locking on certain applications (either native or third-party). Very convenient for browsers, maps, readers and others. The difference between the FREE LITE and Pro edition is the presence of advertisement (and for now, the ability to set your own wallpaper for the lock screen – a feature they are planning to include in the FREE version in time). The application is compatible with devices running OS6 and above, including that of OS7 so, here I have 4 different devices running OS 7 and 7.1 to test out this application on. They include BlackBerry Curve 9360, Curve 9380, Bold 9790 and Bold 9900. All in all, I must say I do love this app as it brings to us something distinctly unique and it is actually rather light at just 300+kb. Processing of the custom wallpaper was rather fast and easy when we are using the normal sized photos, but if we used large photos, it did take a little time to process (which can be expected).